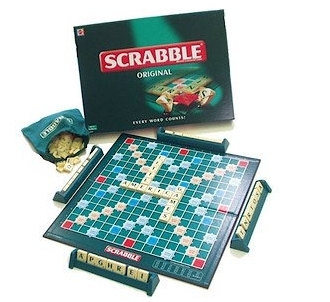 Scrabble is played using a crossword-like Scrabble board which has 15x 15 cells and a pouch of 100 letter tiles including two blank tiles. The Scrabble board is square board with 15x15 grid of cells. You can keep one letter tile on each cell or square. There will be 100 letter tiles with different value points. The points are given depending on the difficulty of making a word with it. Each player can have one letter rack on which he/she can keep the letter tiles. First of all, put all the letter tiles in the pouch and shake them up to mix or shuffle them. Now each player will pick one letter tile from the pouch without looking at the tile and place it on the table. The player with the letter that is closest to "A" will get the first turn to play. If a person draws a blank tile, he will be the first. Decide the turns depending on the tiles drawn. Then all the players will pick seven new tiles each in turn starting with the first player as decided earlier and place them on their letter racks. Each player has to form words on the Scrabble board using letter tiles from their racks. Based on the tiles used they will get scores for the word formed. A score sheet is maintained where each player will mark his/her score after each turn. Words always capitalized, abbreviations, prefixes and suffixes standing alone, words requiring a hyphen or an apostrophe. You cannot use names or brands as words. Players can challege the words formed by others. If the play challenged is unacceptable, the challenged player takes back his or her tiles and loses that turn. If the play challenged is acceptable, the challenger loses his or her next turn. The players should agree to which dictionary they will use, in case of a challenge. The first player must make a word using at least two tiles from his rack and it must be placed across or down the start square in the centre of the board. The tiles cannot be kept diagonally to form words. Now the total points from all the letter tiles used is added to get the total score of the play. Since the centre square is a premium square (yellow coloured) the player will get double score for his word. For example, if the total value is 12, the score will be doubled to 24. The score is noted on the score sheet. The first player will draw as many tiles from the pouch as he/she just played, always keeping the letter tiles on the rack to seven. Now it is the turn of the second player to play. The second player will have to create a meaningful word using one or more of the tiles on his/her rack and adding onto the word formed by the first player. That is the second player cannot just create a freestanding word on the board. At least one of the tiles from the word should be touching a tile in the existing word and that must make a meaningful word. The second player will get points for the word(s) just formed. If he/she makes two words as in the example shown below, he/she will get points for both the words separately. If any of the tile is on a premium square adjust the score accordingly. Note down the points scored by the player. The second player draws the required number of tiles from the pouch and it is now the turn of the third player to form a word using at least one from the existing words on the board and using one or more tiles from his rack. The play will continue this way till all the letters in the pouch exhausted. Anytime, if a player thinks that the word played by any other player is not a valid word or misspelled it can be challenged. Look up the word in the dictionary. If the word is correct then the challenger will lose his or her turn. If you are unable to form a word with the existing tiles, you can exchange some of all the tiles for new ones from the pouch. You will lose one turn for exchanging, that is you cannot form a word in that turn. Just put the tiles face down on the table, shuffle the pouch and pick as many number of tiles you want to exchange and finally put the tiles on the table into the pouch. The tiles should not be shifted or moved once played. The words formed should remain the same way till the game ends. The game ends when all letters have been drawn and one player uses his or her last letter or when all possible plays have been made. At the end, each player scores are added up and the top scorer will be the winner. Utilise premium squares to get maximum points and try to place the high value letters like Z, J, Q, X etc on the premium squares. If you can get a BINGO, that is if you can make a word using all the seven letter tiles on your rack, you will get a bonus of 50 points in addition to the score for the word your formed. In addition, if a player has used all of his or her letters, the sum of the other players' unplayed letters is added to that player's score. So try to discard the high value letters at the earliest. Scrabble is a great game for kids and adults alike. It is a wonderful gift you can give to your children.